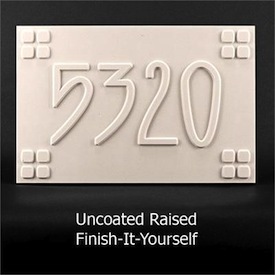 You receive your address plaque unfinished and ready to complete with common available materials. In other words, you get to do the fun stuff; Playing with paints, gold leaf, brushes, inks, epoxies, etc, etc. Fun! Fun! Atlas makes it possible for you create DIY Signs. 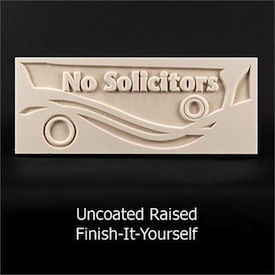 Address Plaques, Gift Plaques, Wedding and Anniversary Plaques, Memorial Plaques, No Soliciting Signs, Privacy Signs, Military Plaques, and so many more, Whew! Actually there is no limit to what you can do when you begin your home improvement project with Atlas Signs and Plaques. Feel free to get carried away. Make it a family project, have a contest, or hide in the basement and keep the joy to yourself (until everyone “goes ape” at your imaginative wonder). Whether you give as a gift or finish for your own home. You have the artistic freedom to create your vision without limitations. You can go mild to wild. You make all the decisions. 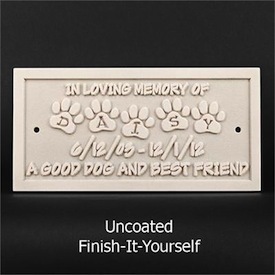 In addition to the unfinished signs and plaques shown in the Uncoated Category, any sign or plaque in entire line-up is available to the Do-It-Yourself enthusiast. Lasts much longer than wood. Cuts with tools that cut wood. Carbon footprint = 3:1. Rapidly Renewable Materials = 23.9%. No VOC’s, Non-Toxic, Totally Inert, and no Carcinogens. Made in the USA. Use latex paints, enamels, gold leaf, colored epoxies, whatever your heart’s desire. Have a custom design cut, get it two sided, or want another size of this sign? We can do that too. Please email us. We are certain that a masterpiece awaits your artistic hand. DIY Signs and Plaques are a fun and easy way to dress up your home and business. This entry was posted in DIY and tagged DIY, Do it yourself, uncoated, unfinished on June 19, 2013 by AtlasSigns. A milestone has been reached. Atlas Signs and Plaques celebrates the shipment of the first DIY Address Plaque. Why are the nice folks at Atlas so happy? Think about how proud you were when you could show off the first dollar that you really earned. Maybe you saved it for a while, but took a photo the dead president before you blew the buck on candy and cigarettes. Yep, kinda like that. Firsts should always be celebrated. 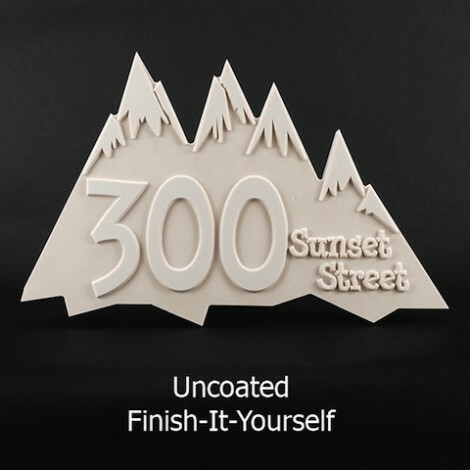 Atlas has been creating beautiful metal coated plaques for some time now, but recently decided to answer the call of some creative DIY enthusiasts who wished to have Atlas complete their personalized plaque right up the the finish stage. As you might imagine, uncoated signs are becoming a real hit with homeowners. Doing it yourself is easy, saves money, and makes your plaque completely personalized. In the photo above. 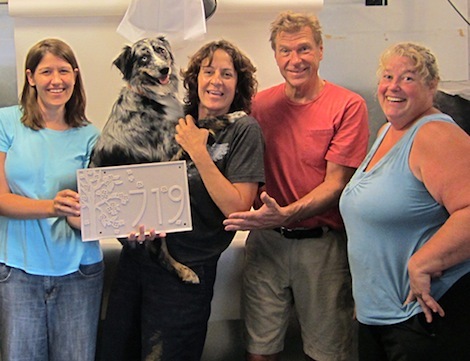 From the left is Amber, Happy (helping to hold the plaque steady while sporting a wide grin) Janey, Lou, and Lisa. This entry was posted in DIY and tagged DIY, Do it yourself, uncoated, unfinished on June 9, 2013 by AtlasSigns.